These kits usually come with a 7.023MHz crystal(s) which are in the EXTRA class bands. 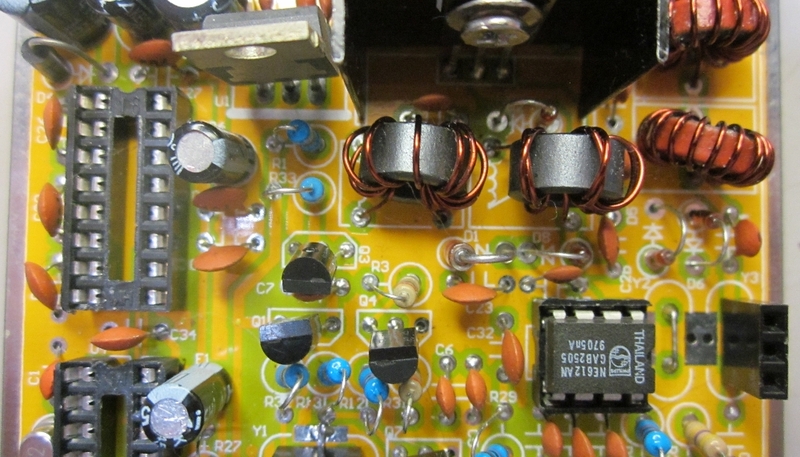 Check out our Crystals page to move these little rigs to the General Tech/Novice frequencies. Note: I do not personally use the software and have bypassed the Keyer IC but the READMEFIRST.txt does have setup instructions. After that your on your own…….Best of luck! Bag of Parts, Printer Circuit Board, Schematic (blurry! ), Parts list, Layout page. No other instructions, however, instructions available on-line. A zip file of instructions & schematics is available here. 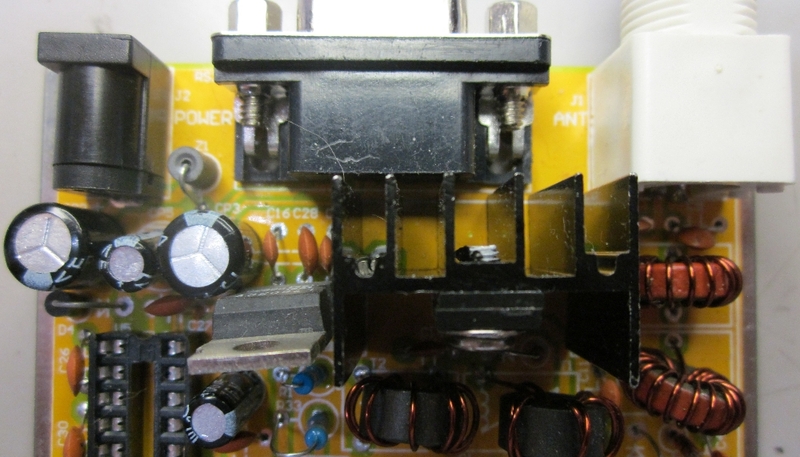 BEWARE OF BAD TOROID CORES and BAD/Low Voltage Capacitors! Several incidences of Rockmites with low power output (1-3W) were the result of bad T37-2 (red) toroid cores. 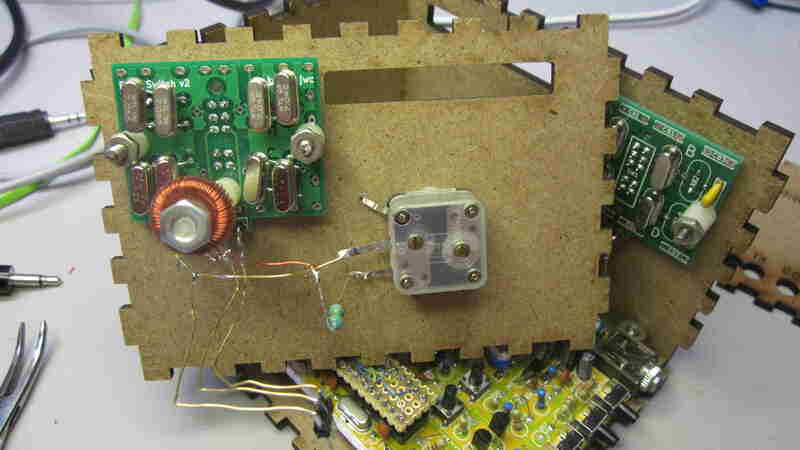 In each case good T37-2’s were replaced resulting in 5W output. Be suspect of cores with a red texture to them. The good toroids should be smooth in appearance. 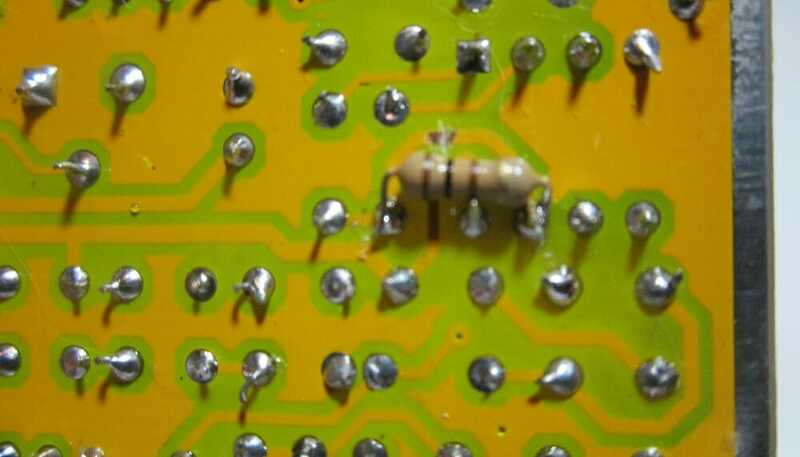 There is also reports of some disc capacitors being bad. Good or bad consider upgrading to 100V or better capacitors in the final amplifer, low pass filter area, and input to the receiver section. More than 50V can appear in these areas at times which is marginal since these appear to be 50V caps. Check and replace C4 (33pF), C8(100pF), C9(470pF), C11(470pF), C12(1000pF), and C25(AKA C26 .1uF). It’s been a while since playing with the Rockmite. Thanks to Bernie, VE3FWF, I now have this cool LASER cut enclosure to put it in. As long as we’re adding an enclosure I tricked it out with Pixie Switches, Super VXO, and replaced the keyer chip with a YACK engine. New clear enclosure Ready to play! There are a few caveats with it all together. The VXO drops out at the extreme end of the band but not enough to worry about. Along with the VXO the Tx/Rx offset varies from -1KHz at the low end to almost zero at the high end. This was predicted when playing with Super VXO’s earlier this year. Retro-fitting the YACK engine was the hardest part as the button logic was entirely different. The YACK sidetone is also a little on the loud side so maybe a little resistor divider or trimmer might be the next mod to adjust the sidetone volume. Super VXO Parts: 150pF PolyVaricon, 15pF cShunt, 18uH Toroid w/ 4.7uH Axial. Add a 1.8K between R21 and R17 on the switch side (Use the RIGHT pads when looking at the top of the PCB). And now back to our regular scheduled program………. The same issues as the Pixie above sans the color coded inductors as there are none. Schematic diagram was blurry and hard to read, impossible in spots. Kit was missing a 2.2K resistor but ended up with an extra 22K resistor as well as extra .1uF (104) and .01uF (103) disc capacitors. Kit was also missing the 10uF capacitors but received extra 1uF capacitors. There is a location next to the audio jack for a 100pF capacitor. This is not marked on the schematic but installing it had no effect. There were NO instructions on what the inductor values are or even how to wind them! Fortunately KB2HSH’s web site had instructions. Can also be found on the SUPER-RM Yahoo group. There are several versions so make sure you download the correct one! The hole for the BNC center connector is slightly out of alignment and too small. I ended up breaking the flimsy wire and fixed by placing a small piece of wire in the PCB then splicing into the broken end. In a few areas non-joining pads are spaced too close together. Watch your soldering and excess lead lengths for shorts. Winding the toroids are not too hard to do. Pick up a strip of break away machine pin headers. Break into 3 pin sections and remove the middle pin. Then insert these into the 3 frequency selective crystal areas. You can then easily change frequencies by swapping crystals. 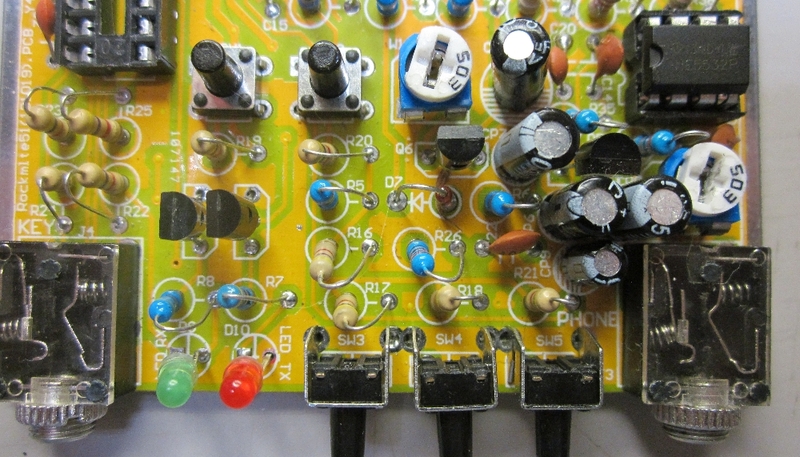 Note: you may end up with a little more noise by not grounding the 2 input filter crystals. RIT is a trimmer and should outright be a potentiometer w/ knob. A good upgrade is putting this in an enclosure. NO Mounting holes! 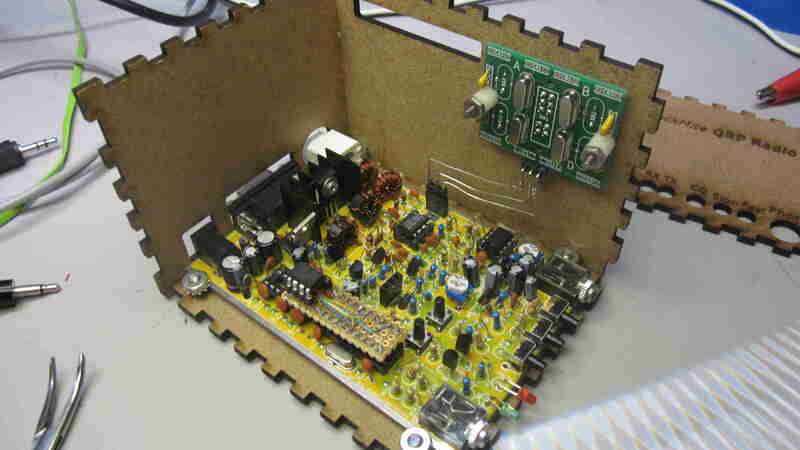 Assumes you are using an enclosure designed to exactly fit the PCB. The Program in the micro is not great. it could use a major upgrade! The DIT and DAH inputs do not auto repeat. Makes the keyer useless! The Sidetone only has a few different tones and sounds funny. Have not even attempted to try the serial port/software. Could not get it into straight key mode! Remove the CPU and MAX232 IC’s – they are not needed. On the CPU Socket Jumper pins 12 (Tx line) and 15 (keyer tip jack) with a piece of wire. Jumper a 4.7K pullup resistor between pins 15 (Tx Line) and 20 (+5V). Snip the lead of resistor R10. This 470 Pullup is too much for the 3CPO keyer (or jumper D501 on 3CPO instead of the 4.7K pullup and R10 snip). There is a horrid tone on the audio around 7.5-11KHz. The problem is somewhere in the audio circuitry. 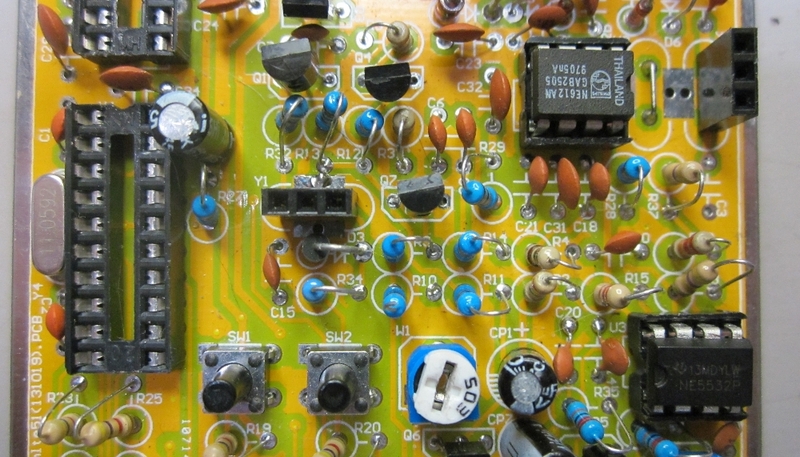 The problem is there with the SA612 mixer, micro, MAX232, and Osc xtal removed from the circuit. 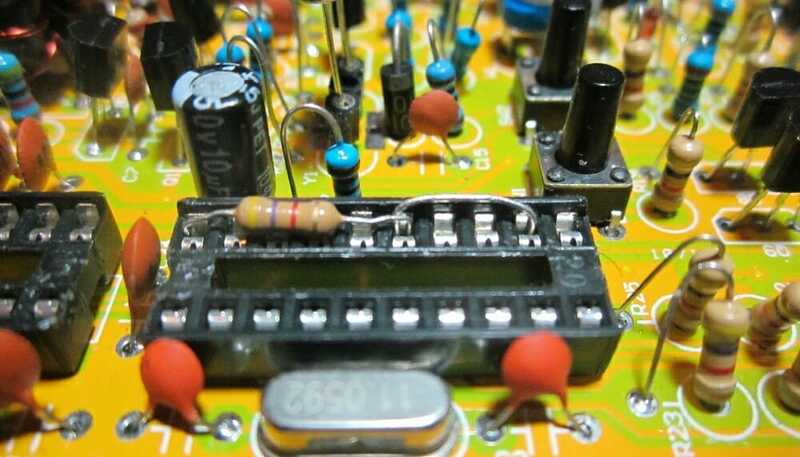 By lifting pin 1 off the op amp and using a simple 470K resistor makes the tone less harsh (still present). Of course you can’t drive your headphones this way. 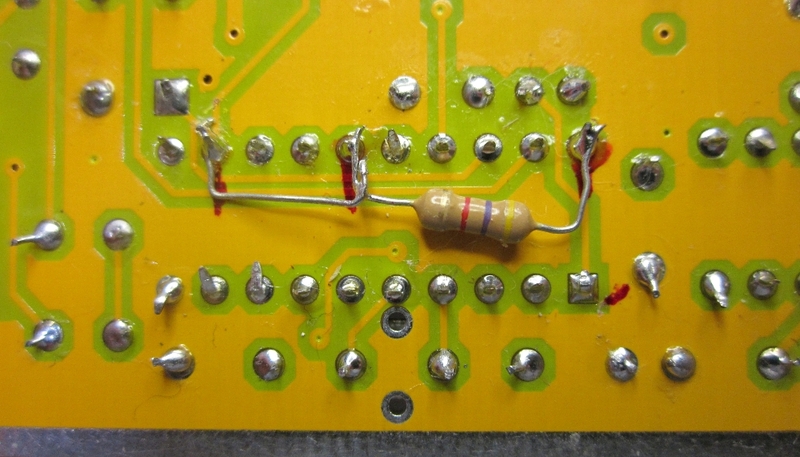 On the bottom of the board, cut the trace between U3 pin 7 and where is leads to capacitors C14&20. 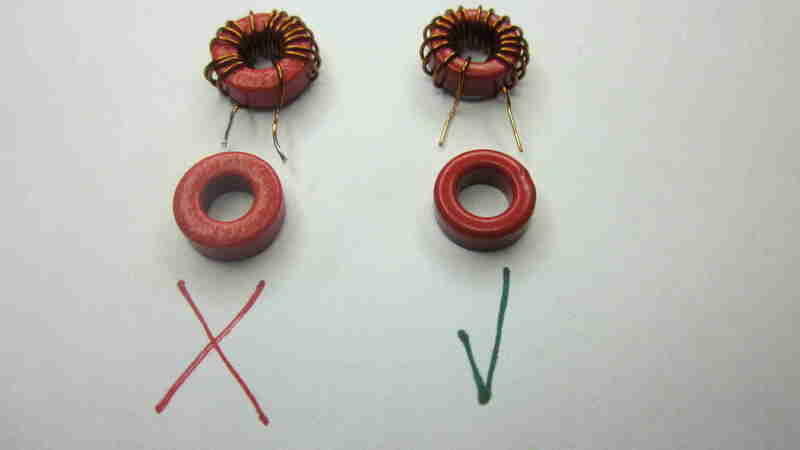 Place a 50-200 ohm resistor between U3-7 and C14. I used a small trimmer and found anything below about 25 ohms causes oscillation. Going above 25 seems to have little effect except to slightly alter the overall noise tone. 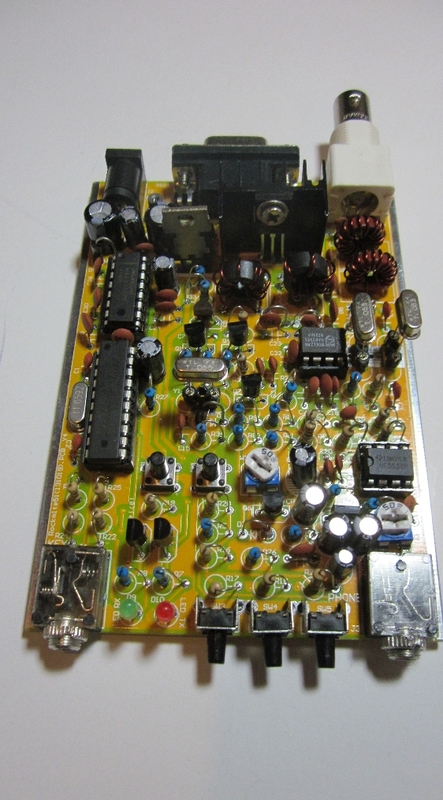 With the keyer and tone problems solved this is looking like a neat little rock bound QRP rig! FLDigi and HRD receiving software does not work well with this board as it sits. I believe this has to do with the way the 2N7000 driver is configured. 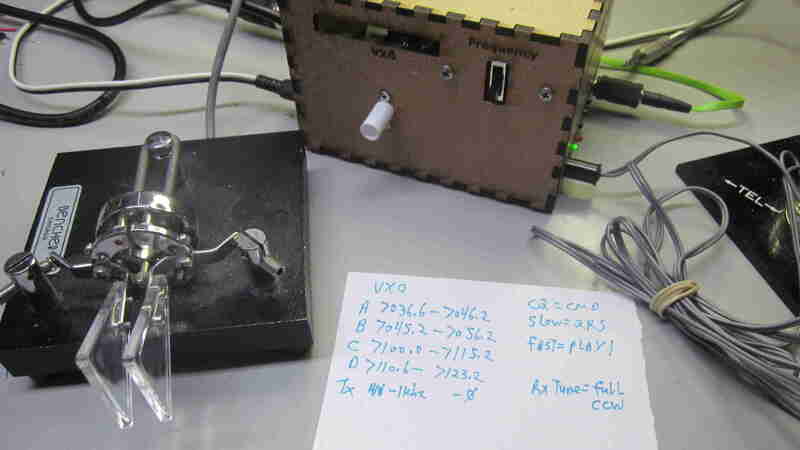 However, tapping directly off pin 1 of U3 using a DC blocking capacitor (10uF) with no attenuator between radio and computer seemed to work the best. Y1 and Y3 uses a socket for a Pixie Switch. Y2 is bypassed with a jumper and C3 is removed.